We’re in the upstairs meeting loft of Old Town Brewing on NE MLK, and even though the air is thick and hot, the crowd of well-dressed attendees bursts forth with an energetic smattering of applause. I’m at the monthly meetup for the Marijuana Business Association (MJBA), “the voice of legal marijuana in America”, according to founder, Dave Rheins. When I arrived, Rheins was circulating around the room, snapping photos and shaking hands. After taking my picture, Rheins introduced himself. There was a table with a framed 1940’s style poster featuring a smiling woman wearing victory rolls and clutching a bundle of marijuana buds. “The Green Rush is ON!” the poster proclaimed. Indeed. As Oregon stands on the threshold of legalization, the convergence of the cannabis and technology industries in Portland is bringing new opportunities to the Silicon Forest, and people are looking to cash in. As state laws relax and public perception shifts, those in the cannabis game are now able to grow their business creatively and in ways that weren’t previously available to them. The businesses Diggles is talking about are the long-time suppliers who have been serving medical patients for decades and now are becoming overwhelmed with the new language they’re hearing from people in the technology startup field. There’s a definite divide between these two groups, and medical cannabis suppliers are definitely feeling the need to catch up now that they’re able to run their operations with more freedom. If anyone is in a position to bridge the gap between old and new, it’s Jenny Diggles. Not only does Diggles have years of technology startup experience under her belt, including an ecommerce site and an iPhone game, she also runs Metis Consulting Group, a firm dedicated to serving cannabis-related businesses. In fact, one of Diggles’ latest ideas came out of conversation with a fellow businesswomen about the lack of resources available for finding quality cannabis foods. So Diggles came up with the plan for Mary Baked, a site where users can share reviews and information about edible goods. Sites like Mary Baked have the potential to not only help businesses grow their revenue by fulfilling customer demand, it can also keep consumers safe from questionable products. Diggles’ idea began to gain traction in certain circles, and she was encouraged to enter into a local startup competition, which is where I first met her. It was clear on the first night of the competition that green was a theme, as a number of startup ideas focused on building technology to serve the cannabis industry. Although Mary Baked was one of the more popular ideas, event organizers warned Diggles that since marijuana was still illegal on the federal level, the sponsors may decline to support her. Diggles pressed forward anyway, proving that she had touched on a market in need by taking home the award for Best Customer Validation. And sites like Mary Baked are a perfect example of how cannabis and technology are coming together by providing a service to an industry without actually touching it’s main product. Diggles mentions sites like Leafly, where users can rate cannabis strains, choose ones based on their medical needs, and find specific dispensaries, but says that until now most businesses have been focusing on more functional aspects when it comes to technology, like seed-to-sale tracking systems and security. Now that operators will have more freedom around building and growing their business, there’s a chance for them to develop what Diggles calls the “nice-to-haves”. This is where Diggles see the most potential for growth, as entrepreneurs may be curious to get involved in the industry, but may have apprehensions about working directly with the product. And although Diggles wants to encourage more entrepreneurs to get involved, there two caveats she has for anyone considering a career in cannabis technology. 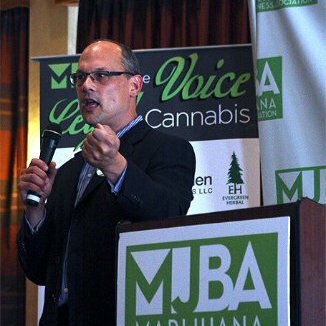 As we head to the MJBA meeting, Diggles talks at length about how she wants people unfamiliar with cannabis to understand that there is a time and place for it. She explains how some novice users compare marijuana with alcohol, and will base their cannabis intake on how much alcohol they can drink. She also talks about terms like “stoner” and how it’s commonly used to describe pretty much anyone who smokes marijuana. “It’s like calling anyone who drinks wine a drunk,” she laughs and shakes her head. At the MJBA meeting I flip through a picture booklet of marijuana buds with names like Old Time Moonshine, Old Time Indiana Bubble Gum, and Lord Humungus. In front of us an entrepreneur describes how he overcame his prejudice and was convinced to enter the cannabis industry after talking to Tommy Chong at a celebrity golf tournament. We hear from developers building point-of-sale systems for dispensaries, and I talk with a ventilation expert who specializes in optimizing airflow for home growing operations. When I ask him to imagine an app that would help make his business and life easier, he looks at me perplexed. “I guess I’ve never thought of that before,” he says to me, “let me think about that.” He returns a few minutes later with a list of problems and a few ideas.